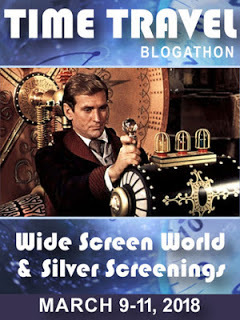 This is my second entry in the Time Travel Blogathon hosted by Wide Screen World and Silver Screenings. Take Japanese karate chop-socky star Sonny Chiba (next to Bruce Lee and Jackie Chan, probably the most famous of the Asian action movie stars of his day), give him a role as a army officer leading a group of soldiers through a war games trial, Use some hocus pocus of some sort to transport them through time to feudal era Japan, and have him and his cadre of soldiers join a group of samurai warriors from said era in a battle for supremacy, and you have the makings of one of the more bizarre entries in the science-fiction field to ever come to the theater. Sonny Chiba had been a karate film star for several years by the time this film was made. 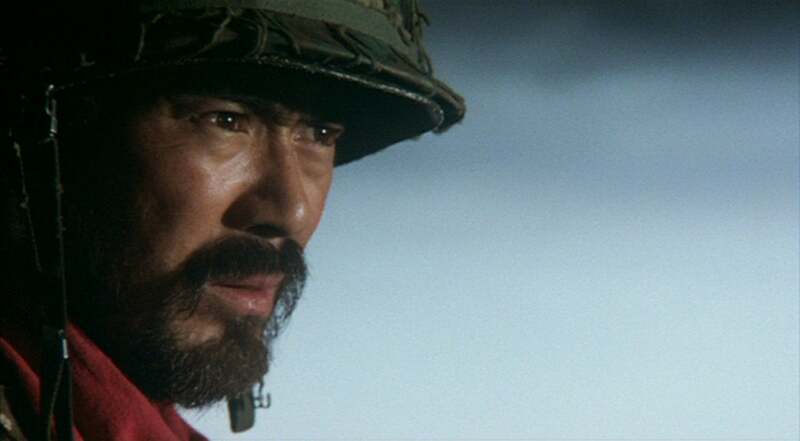 He got his start on Japanese TV, but made himself an international star in The Street Fighter, a Japanese karate movie along the same lines as much of Hong Kong's international output of the era. 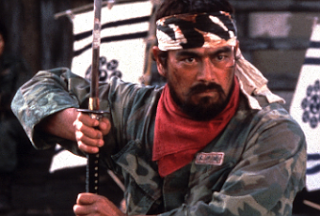 Over the past 60 years he has had a prolific career, both in the martial arts movies that brought him to prominence here in America as well as some pretty good action and period dramas. (He was featured in both Quentin Tarantino films Kill Bill Vol. 1 and Kill Bill Vol. 2, and was a costar in the The Fast And The Furious series entry titled Tokyo Drift. 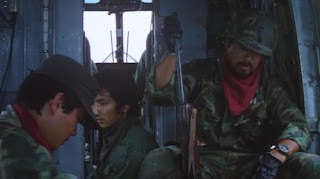 The group is led by Lt. Yoshiaki Iba (Sonny Chiba), who looks a lot like a Japanese version of DC comics WWII hero Sgt. Rock. 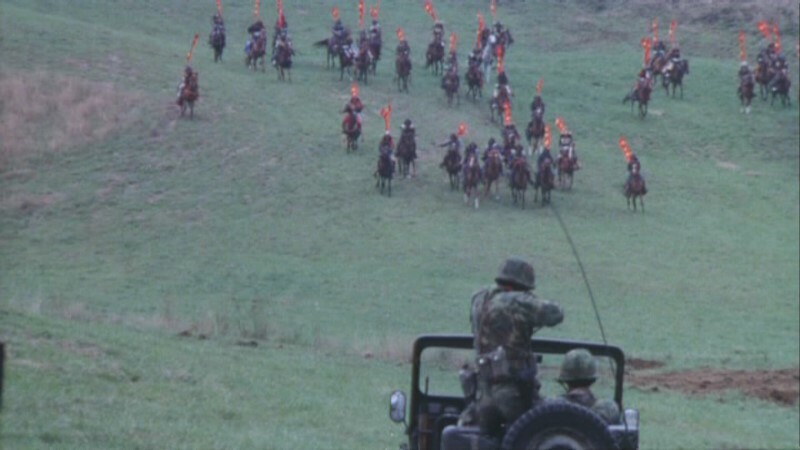 It turns out that the soldiers have ended up 400 years in the past during what is referred to by the men as "The Warring States Period" of Japanese history. 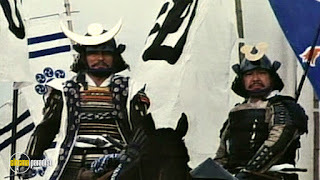 The men are met by a cadre of samurai soldiers led by Nagao Kagetora (Isao Natsuyagi). Kagetora immediately claims Iba as a comrade in arms and his oft repeated phrase is "you are from my tribe!" 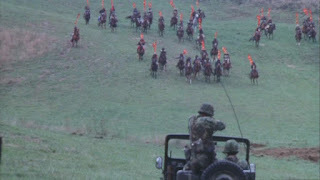 The samurai warriors leave, but a different group of warriors, led by an attack of ninja archers who pop up from beneath the water attack the group. Eventually the modern-day soldiers are able to defend against the attack, but a couple of soldiers are lost. 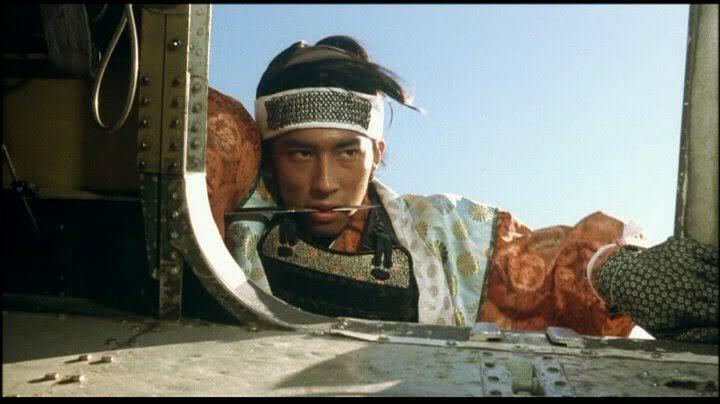 Iba joins forces with Kagetora to defeat Lord Shingen, the local ruler. 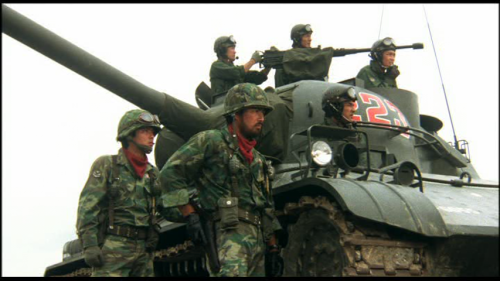 You would think even with just one tank, one helicopter and a halftrack vehicle and a bunch of machine guns, that the modern day contingent would have a field day against medieval forces wouldn't you? Not entirely. There are about a thousand or so samurai warriors and they all have the bravery of unlimited potential. In the process just about every modern day vehicle is taken out of the equation. And of course there are a limited number of rounds for the machine guns and the like. The finale is worth the wait. 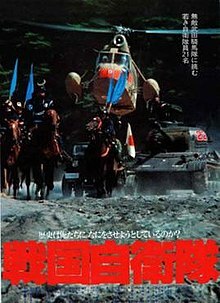 Seek this one out if you like a good action movie, and if you like time travel stories this one is sure to be an interesting endeavor. Time to go home now, folks. Drive home safely. I saw STREET FIGHTER several years ago, and that was pretty wacky even for a chop socky flick. If this is in that vein, I may have to give it a look. It's a little different, but it is a cool movie. Thanks for reading. It is pretty cool. Thanks for reading.